The US Senate has voted in favor of a package of measures to avert temporarily the so-called “fiscal cliff” (but in doing so, has set up a new cliff that will hit in two months). As I write this, it is not yet clear whether the House of Representatives will vote to pass this compromise, or will try to amend it, or will attempt something else, but right now a vote appears imminent. But there is one aspect of the deal which has not received much attention in at least the public discussion of what is being voted on: While it is recognized that extending the Bush Tax Cuts will slash government revenues over the ten year period being discussed (2013 to 2022), little attention has been paid to the long term impact if the Bush Tax Cuts were made permanent. The Bush Tax Cuts were originally passed under legislation where they would expire on December 31, 2010. With the economy then still extremely weak, Obama signed legislation in December 2010 to extend the cuts for a further two years, to December 31, 2012. Other recent tax measures (including in particular the effective rates for the Alternative Minimum Tax) also were set with an expiration date of December 31, 2012. The issue being debated in the Congress is whether these tax cuts should be extended again, in whole or in part. Both Obama and the Republicans have been in favor of extending them for most households. The debate has centered on whether taxes should be allowed to revert to what they were during the Clinton years for households with incomes over $250,000 a year, over $450,000 a year, or over $1,000,000 a year, or some other number within that range. This corresponds to extending the Bush Tax Cuts permanently for approximately 97% of the population ($250,000), 99.3% of the population ($450,000), or 99.7% of the population ($1,000,000). The bill passed by the Senate would extend the Bush Tax Cuts permanently for the 99.3% of households earning up to $450,000 a year. That is, almost everyone would continue to pay the lower tax cuts first passed during the Bush Administration. Even the remaining 0.7% of the population would see their taxes fall similarly on their first $450,000 of income. Beyond that, their marginal tax rates would revert to those that applied during the Clinton years. Since the richest 0.7% earn so much more than the rest of us, there would still be a substantial increase in tax revenues paid. The estimate is that the tax measures in the bill passed by the Senate would raise tax revenues by about $600 billion over the ten years 2013 to 2022 (i.e. by $60 billion per year). There would have been an estimated extra $4.5 trillion in revenues over the ten years if the Bush Tax Cuts and the other tax measures had been all allowed to expire. The $600 billion is only 13% of the $4.5 trillion. That is, 87% of the Bush Tax Cuts (and related tax cuts) are made permanent. The problem of what to do about the fiscal deficit over the next ten years will therefore largely remain. As Jeff Sachs has noted in a recent column, without the revenues that will be lost by making the bulk of the Bush Tax Cuts permanent, it will be hard to pay for the basic government programs that most consider important. But what few have noted is that extending the bulk of the Bush Tax Cuts not only hurts the fiscal balance for the next ten years, but makes the situation far worse beyond that. The graph above shows projected federal government revenues up to the year 2037 under two scenarios: where the Bush Tax Cuts (and AMT and other related tax measures) are allowed to expire as scheduled (the Extended Baseline Scenario), and where these tax cuts are instead made permanent (the Alternative Fiscal Scenario). The projections are from the Congressional Budget Office in their Long-Term Budget Outlook, of June 2012. We do not yet have what the projections would be to 2037 under the Senate bill, where taxes are allowed to revert to previous levels only for those earning over $450,000. 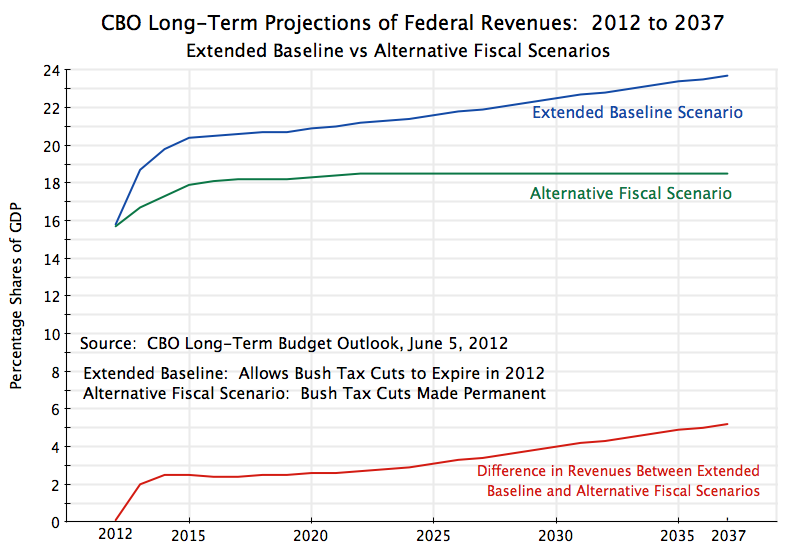 However, since this would recover only 13% of the revenues that would be lost if the Bush Tax Cuts were extended for everyone, the curve would lie between the two shown above, but relatively close to the curve labeled the Alternative Fiscal Scenario. If the tax cuts are made permanent for all, the CBO projects that federal revenues would recover over the next three years from their current very low levels (low due to the economic downturn), but then flatten out and not rise above 18.5% of GDP even in the very long term. In contrast, if the tax cuts were allowed to expire for all, federal revenues would first recover, but then continue to rise slowly to 21% of GDP by 2021, to 22 1/2% of GDP by 2030, to 23 1/2% of GDP by 2036, and to continue on that rising path beyond that. The increase in taxes as a share of GDP over time, were the Bush tax rates allowed to expire and revert to their previous levels, is interesting and important. The tax share is projected by the CBO to increase because GDP is projected to grow over time, and under the previous tax regime the tax system was progressive, with higher incomes leading to higher tax rates and hence higher tax collections. In contrast, under the tax regime brought on by the Bush Tax Cuts, the system is no longer progressive: When GDP grows over time, those receiving the higher incomes will only pay taxes at rates similar to those who are poorer, so taxes as a share of GDP remains flat. This loss in progressivity of the tax system may well be the most damaging aspect of the Bush Tax Cuts. Relative to the previous system with progressivity, the tax cuts have led not only to a loss in revenues, but also to a system where on average higher incomes do not result in a higher rate of taxes on that higher income. As Warren Buffett has noted, a person as rich as he is will pay, under the current tax system, a lower rate of taxes on average than his secretary. This will not change significantly under the bill passed by the Senate. And the losses in revenues as a share of GDP become steadily larger over time as the economy grows. The losses in revenues are huge. They start at about 2 1/2% of GDP from 2014 to 2020, but then rise to 4% of GDP by 2030 and to 5% of GDP by 2036. Keep in mind that future governments could decide that such extra revenues are not needed. If so, they could then enact tax cuts of a size and structure suitable for the time. But it is far easier to legislate tax cuts in the American political environment than it is to legislate tax increases when extra revenues are needed. With the difficult long term fiscal outlook that most foresee for the US, an ability to raise adequate revenues will be critical to the country’s long-term financial stability. But I should add that while this is a critical long-term problem, this does not mean that the Bush Tax Cuts should all end immediately, as they would have under the fiscal cliff. Unemployment, while better than three years ago, remains high. Rather, the optimal path would be to phase them out over the next few years. A reasonable policy would be to link them to the unemployment rate. To start, taxes would revert now to those of the Clinton period (when growth was solid, and the fiscal accounts moved to surplus) for those with income over $250,000. Taxes would then revert to Clinton period rates for those with income of over $100,000, say, when the unemployment rate had fallen from the current 7.7% to a rate of perhaps 7%, and then taxes would revert for everyone once unemployment had fallen to below 6%. But under the Senate passed bill, this will not happen. This entry was posted in Fiscal Issues and tagged economic crisis, fiscal deficit, policy, tax system, taxes by aneconomicsense. Bookmark the permalink.